“Crossover (kraws-oh-ver) noun: A simple basketball move in which a player dribbles the ball quickly from one hand to the other. As in: When done right, a crossover can break an opponent’s ankle. 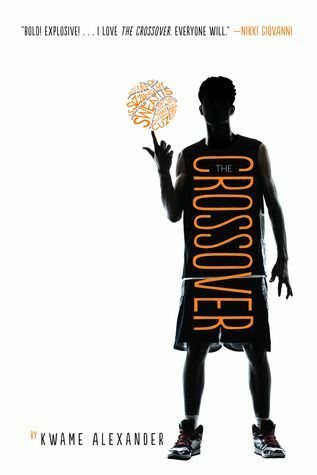 If you haven’t heard of Kwame Alexander’s The Crossover yet, you are about to. These are a few of the notable awards and recognitions this novel has received thus far: 2015 Newbery Medal Winner; 2015 Texas Lone Star Reading List; 2015 Coretta Scott King Award Honor, and Charlotte Huck Award for Outstanding Fiction for Children. So much punch and content is packed in to this short novel in verse. It is about two 14-year-old twin brothers, Jordan (JB) and Josh Bell (aka Filthy McNasty) who live and breathe basketball. How could they not, their father is ex-NBA star, Charlie “Da Man” Bell. When together and on the court, the brothers are unstoppable. But, with growing up they face struggles and changes. Their father’s health is declining and he refuses to acknowledge the possible severity of the situation, JB gets a girlfriend, and their mother is the assistant principal of their high school. This beautiful and moving novel is powerful, and a necessary read for anyone who is a fan of novels in verse, realistic fiction, basketball, or if you are just looking for a good book in a new genre. Alexander’s prose is visceral to the point that you can feel the denotation in the verse and the tension in the atmosphere on, as well as off the court. Also, the references to basketball and players are relevant and significant. This book left me in awe, inspired, and is by far my favorite novel in verse. This entry was posted in Audrey, novel in verse, poetry and tagged Audrey, Basketball, Coretta Scott King Award, Diversity, favorite, Newbery Award, novel in verse, realistic fiction, TX Lone Star List. Bookmark the permalink.